The Midnight Review: When Was The Last Time You Heard Mention Of The "Ground Zero Mosque?" When Was The Last Time You Heard Mention Of The "Ground Zero Mosque?" 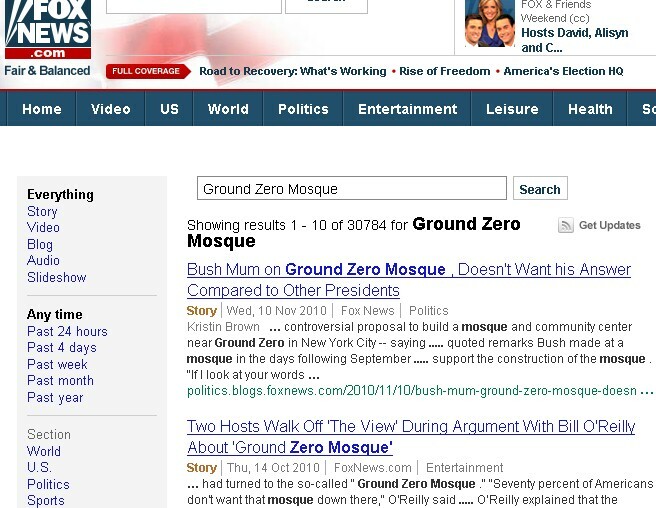 This is something very interesting - since the passing of the mid-term elections, mention of the "Ground Zero Mosque" has become pretty much non-existent in both the mainstream media and the right-wing news. The news stories seemed to culminate just right before the election. 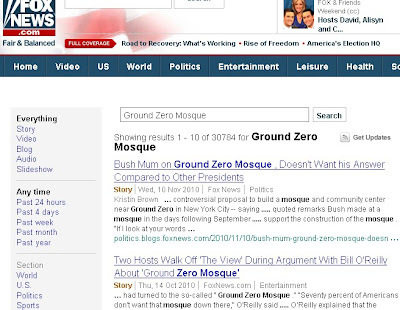 Doing a search on Fox News, which spearheaded the reporting, there was only one recent article discussing the Park51 community center - it revolved around President George W. Bush's opinions on the matter. "I think that most Americans welcome freedom of religion and honor religions. I truly do," said Bush. "The problem with the arena today is a few loud voices can dominate the discussion, and I don't intend to be one of the voices." After the story regarding Bush's comments made to "Today Show" host Matt Lauer on November 10th, can you guess when the last "Ground Zero Mosque" story was? Why has this issue no longer an issue among the right? Could it be that it was only used to rile up the conservative base prior to elections?